Since 2011 I’ve had a free iOS app called 9/11 that contained thousands of photos and videos related to the 9/11 terrorist attacks. It was possibly the largest collection of such photos outside of government archives, and it’s been downloaded well over 100,000 times. The app (along with all of my other apps) is now gone for good, but the photos and videos are accessible here: https://basepath.smugmug.com/Photocoll/911. WARNING: Many of the photos and, especially, the videos are disturbing. This entry was posted in General on 28-December-2018 by admin. This entry was posted in General on 28-May-2018 by admin. Support for all but ProofSheet and ExifChanger had already ended last December, and now I’ve ended support for those two apps, too. If all you need is a lost unlock code, you can email me directly for that. This entry was posted in General, Uncategorized on 26-March-2018 by admin. I’ve had Amazon Prime Music for a while, and have been paying $25 a year so I can upload as many CDs as I want, up to 250,000 songs which is at least 200,000 more than I have. That’s peanuts. Literally: We spend about $100 a year on peanuts. Most new CDs I buy from Amazon are also automatically added to my cloud library. There are apps for all iOS and Android devices, and all my computers. I get Prime Music (part of my Prime subscription), in addition to my own stuff. The best part is the curated playlists. I mostly play Amazon Music through my desktop and a seldom-used Google tablet connected via a cable to a Bose Acoustic Wave player that I bought about 20 years ago. To that I decided to add a bluetooth speaker so I would have something near my favorite chair, to take outside, and for road trips. Prices at Amazon are between about $9 and $800. My range was between $100 and $200, which limited me to about 300 choices. So, I did what I always do in cases like this: Spend a half day reading reviews and clicking around on Amazon until I’m at the point when all of the ratings and opinions cancel each other. In the end I bought a JBL Charge 3 on sale at Target for $130. It has one unusual feature: It can charge an iPhone (or any other USB device). JBL says 20 hours of battery life, so I’m sure I’ll get at least 10 (less if I’m charging my phone). It’s also waterproof. Not that I’m going to dunk it, but I might spill a beer on it. Does it sound better than any of the other 300 or so other choices? Definitely! It was top rated in reviews! Well, the reviews in which it was top rated, anyway. In other reviews it was a dog, but I don’t have to read those, right? Anyway, at this point it’s the speaker next to my chair, the others aren’t, and it sounds just great. Compared to my all-B&W home theater, it’s garbage. Compared to the Bose, it’s pretty good, although the Bose is better. But the B&Ws are downstairs and the Bose is in another room. And neither is portable. So, I guess I’m recommending the JBL Charge 3. If you want something else, there are probably 20 speakers at roughly the same price that sound just as good. The trick is to take home just one and leave the others in the store. This entry was posted in General, Uncategorized on 2-August-2016 by admin. Copenhagen and Stockholm, from a recent trip. Click on the “My Panoramics” box at the bottom of this page. This entry was posted in General on 1-July-2016 by admin. I never post vacation photos, or anything else that personal, but here’s an exception: A panoramic shot of our cruise ship (Carnival Victory) at Ocho Rios, Jamaica, taken last Tuesday. This entry was posted in General on 3-January-2016 by admin. I’ve had a Chromebook for over three years now, bought with the idea that when I’m not actually in my office, I spend nearly all of my time in Chrome anyway, so maybe a $250 laptop is all I need. That idea turned out to be correct. I started looking into Chrome Apps, and even wrote a book for O’Reilly about how to develop them. My committee work for the Conference on World Affairs (CWA) uses Google Docs mostly, so that made the Chromebook even more useful. Still, there are two kinds of things the Chromebook can’t do: Handle my photography post-processing, and develop and maintain my mostly-PHP websites, such as the one I built for the CWA. So, I thought, maybe a Linux computer could do more of what needs doing than a Chromebook? I had an unused monitor, a bunch of unused keyboards and mice, so all I’d need would be the computer itself. I had several of those, too, huge monsters that are heavy, too large for the space on my desk, noisy, and power hungry. Not at all the sort of thing I’d want anywhere on the main floor of the house. And, if I have to go downstairs to use the Linux machine, I might as well just use my iMac. I wanted something cheap, quiet, small, and low-power. The best thing about the NUC is that it screws to monitor’s VESA mount. I strapped the NUC’s transformer to the monitor as well, as you can see in the photo. It’s an all-in-one! Installing Apache, MySQL, and PHP on Ubuntu were very easy, as you’d expect (they’re the last three letters in LAMP), and my favorite MySQL admin tool, MySQLWorkbench installed easily, too. There was a hassle getting it to connect to the instance hosted by Siteground, but that was their fault (quickly and courteously corrected by them), certainly not Ubuntu’s. I’ll miss Coda for editing and updating the website, but a utility called weex works very well to copy just changed files to the server, so I don’t really need Coda for that. I haven’t bothered to chase down all the various Linux text editors to see which one I like; the included gedit seems to be OK, at least for now. Anyway, based on the first few days, this Ubuntu/NUC computer is going to be just fine. My photography has to stay on the Mac (but see last paragraph), because while Linux photography apps, such as Darktable, show promise, they’ll probably never catch up to Lightroom and the Topaz plugins I like, and I have no plans to produce inferior photography just to further the cause of open source. Still, treat this as a glowing review of Ubuntu, and of the NUC, too. My long-term plan is to see if I can use the Mac for photography only, which means using just my own Ingestamatic, Lightroom (with the Topaz plugins), and Photoshop. If I can get that far, I can move my photography work to a Windows system, since those apps all run on Windows, and then use the Mac only for truly Mac-only jobs, such as maintaining my Mac apps. Why do this? Two reasons: I hate Apple, and my iMac isn’t fast enough any more to be pleasant to use. I don’t want to spend more money with Apple, so a fast Windows box may be the answer. But, I’m not there yet. I need to see how far I can get with Ubuntu on the NUC first. Stay tuned. This entry was posted in General on 14-December-2015 by admin. 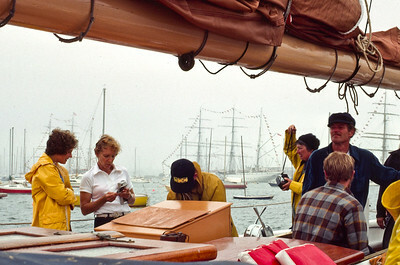 In 1976 I sailed, as a passenger, on the Roseway (see below) from Camden, Maine, to New York for Operation Sail, a gathering of hundreds of sailboats to celebrate the Bicentennial, on July 4, 1976. The main attraction was 16 tall ships. “Tall ship” doesn’t have an exact definition, but they are all large and square-rigged. The Roseway isn’t a tall ship—it’s a schooner that’s only about 130 feet long and squeezes in about 35 passengers plus crew. I shot a few hundred pictures during the 2-week voyage from Maine to New York and back. My camera at the time was a completely manual Konica FP SLR. 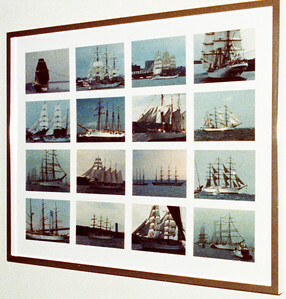 Later in 1976, as I was going through my 4×5 prints, I made the happy discovery that I had at least one photo of each of the 16 tall ships. I didn’t remember all of the names, so I matched the photos against those in an Op Sail ’76 guidebook I had bought somewhere along the way. Then I arranged them into a 4-by-4 grid and mounted them in a large frame. I must have been pleased with my work because I took a picture of it (above). Years later, the pictures all fell from the mounting board (I recall that they were fastened with double-sided Scotch tape) and collected in a pile at the bottom. None of the pictures were labeled, but they had been arranged in alphabetical order. Earlier this year  I scanned all 1000-or-so of my slides, including the few hundred from Op Sail. Just today, I decided it was time to try to find the original 16 photos that were in the montage so I could put it back together, but this time digitally. I didn’t have the original prints (I’m sure they’re around somewhere), but I did have that shot of the framed arrangement. Also, I remembered seeing that guidebook and found it on the basement shelves where I keep my old books. I got them all matched except for the Mircea (bottom-left). I either lost that slide or didn’t scan it, but, rather than go back to the slide tray to see, I just used another taken a few seconds later. Here’s the result: All digital, rearranged into the same montage (without tape, this time). Note how I was able to improve the white balance and exposure with Lightroom. This entry was posted in General on 4-May-2015 by admin. A few bugs fixed that resulted in external verification failing when the archive was good. Any archives reported as good were good. This entry was posted in General on 2-May-2015 by admin.